Please be advised, boots are not made for snow and ice or heavy walking. The classic UGG® silhouette just got a glamorous update with the Classic Short Serein. Suede upper features a shimmered finish. Luxuriously lined with UGGpure™ wool for a breathable and warm environment. 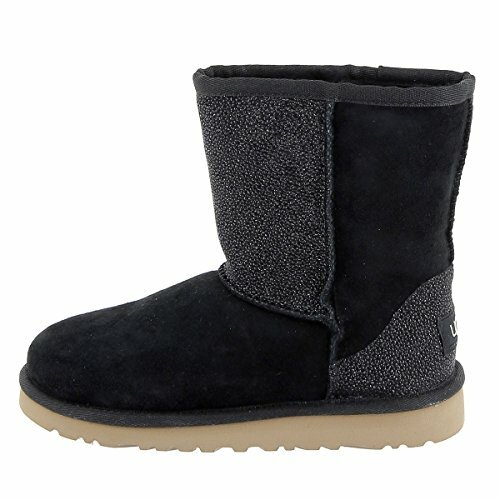 Generously cushioned footbed is lined in UGGpure™ wool. New Treadlite by UGG™ outsole provides increased traction, durability, cushioning, and flexibility. Imported. Measurements: Heel Height: 1 in Weight: 9 oz Circumference: 12 in Shaft: 6 in Platform Height: 1⁄2 in Product measurements were taken using size 13 Little Kid, width M. Please note that measurements may vary by size. The classic UGG® silhouette just got a glamorous update with the Classic Short Serein. Suede upper features a shimmered finish. Generously cushioned footbed is lined in UGGpure™ wool. New Treadlite by UGG™ outsole provides increased traction, durability, cushioning, and flexibility. Imported. Measurements: Heel Height: 1 in Weight: 9 oz Circumference: 12 in Shaft: 6 in Platform Height: 1⁄2 in Product measurements were taken using size 13 Little Kid, width M. Please note that measurements may vary by size.